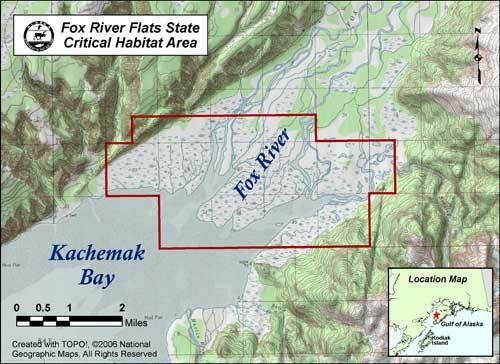 Located at the head of Kachemak Bay, Fox River Flats Critical Habitat Area encompasses expansive intertidal mud flats and a complex of low-lying marshlands in the lower Fox River Valley. For more information on the Fox River Flats Critical Habitat Area please refer to the Fox River Flats Management Plan. For current land status information, see the Fox River Flats Land Status Map (PDF 297 kB). You may also download the KML file which depicts the refuge area boundary.